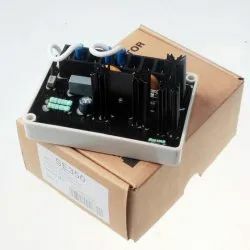 Offering you a complete choice of products which include r450 automatic voltage regulator code aem 110 re 031 for leroy somer alternator, avr unit, generator avr card, avr for crompton greaves sr-7/6, r230 avr automatic voltage regulator and avr r448 leroy somer. We are dealing leroy somer / elgi/ stamford / cg/ kirloskar / all type of avr with all engine controls etc . 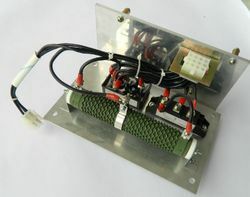 . .
Half-wave phase-controlled thyristor type Automatic Voltage Regulator (AVR) and forms part of the excitation system for a brush-less generator. In addition to regulating the generator voltage, the AVR circuitry includes under-speed and sensing loss protection features. Excitation power is derived directly from the generator terminals. Positive voltage build up from residual levels is ensured by the use of efficient semiconductors in the power circuitry of the AVR.The AVR is linked with the main stator windings and the exciter field windings to provide closed loop control of the output voltage with load regulation of +/- 1.5%. 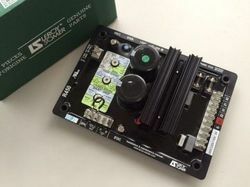 In addition to being powered from the main stator, the AVR also derives a sample voltage from the output windings for voltage control purposes. In response to this sample voltage, the AVR controls the power fed to the exciter field, and hence the main field, to maintain the machine output voltage within the specified limits, compensating for load, speed, temperature and power factor of the generator. The R448 positive voltage build up from residual levels is ensured by the use of efficient semiconductors in the power circuitry of the AVR. The AVR is linked with the main stator windings and the exciter field windings to provide closed loop control of the output voltage with load regulation of +/- 1.0%. The R220 is an IP00 product. It must be installed inside a unit so that this unit's cover can provide IP20 minimum total protection (it must only be installed on LS alternators in the appropriate location so that when viewed externally, it has a higher degree of protection than IP20). 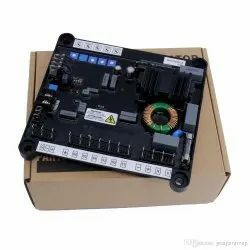 The alternator with Shunt excitation is self-excited with an R 220 voltage regulator.The regulator monitors the exciter excitation current as a function of the alternator output voltage. 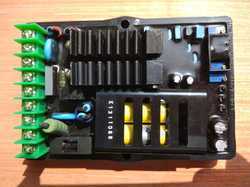 Very simple in design, the alternator with shunt excitation has no sustaining short-circuit capacity. 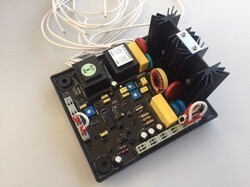 For wiring up the external potentiometer;the "earth" wires must be isolated as well as the potentiometer terminals(wires at the same voltage as the power). 6GA2-491-1A is applied for Alternator and other phase compound excitation alternators. It is with good dynamic performance and can be used parallel. Quantity discounts are available for this item. Leroy Somer R450M Automatic Voltage Regulator - Genuine and made in France. The R450M is used for shunt & PMG exciter alternator systems, it can also be used for paralleling. 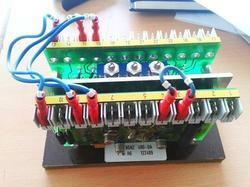 This AVR is suitable for brushless generators upto 500kVA of makes like Delcot. 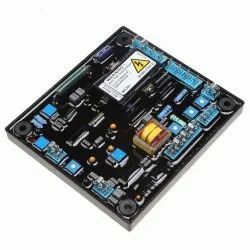 This AVR is a compact high performance encapsulated unit with latest technology and efficient Semiconductors to achieve a high degree of miniaturisation. This AVR contains a solid state buildup circuitry to ensure positive voltage buildup from very low residual voltages. 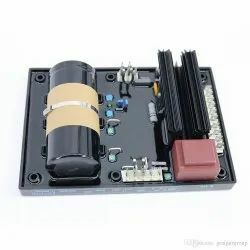 This AVR employs true average sensing circuit, dv/dt, snubbers and special filter circuits to cope with Non-Linear loading like Battery Chargers, DC drives etc. The AVR regulates the generator voltage and the recovery time on sudden loading is likely to be around 0.5 sec to recover 98% of the rated voltage. 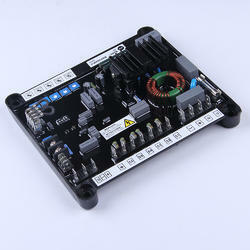 This AVR can be used for both single phase and 3 phase alternator. 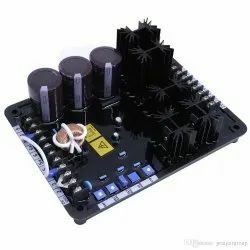 This AVR is having special features like over Excitation and Sense loss which protects alternator from high excitation and high voltage respectively with LED indications. In addition to this it includes under speed protection with LED indication to prevent the generator rotating parts from over heating due to over fluxing. The voltage regulator type"MARK V", is suitable for Synchronous Generators of MARELLI MOTORI make, MJB series, size range 160-225 frames. The regulator is fully insulated in order to maintain high reliability also with severe ambient conditions(high level of humidity, dust, salt atmosphere), and in case of high vibrations level. The regulator is proper both for single and 3-phase generators. 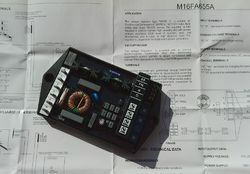 MARELLI AVR M16FA655A is our new design, It is very good performance and low price as well as original. 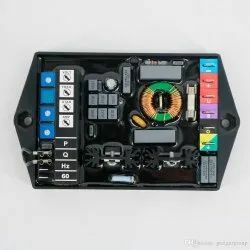 The regulator is provided with internal circuits in order toreduce the excitation, when running at low speed, in order toavoid damages to the excitation devices system of thegenerator (i.e. to the regulator, to exciter field, to rotatingrectifier, main rotor). 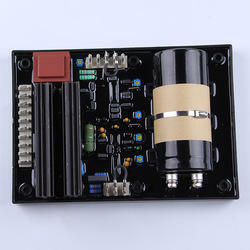 The potentiometer “P2/FREQ”, fixesthe corner-frequency, that is the frequency at which thatprotection becomes effective. Below that particularfrequency the voltage of the generator reduces further withspeed reduction (voltage reduction is twice the reduction inspeed). We Are Dealing Kirloskar,stamford,mec-alte,leroy Somer , And Other Controls With All Etc . 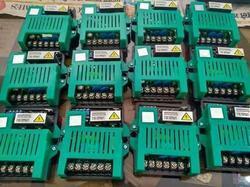 AVR (Automatic Voltage Regulator) for generators (1FC4, 1FC5 series & 1FC6 series that made by WEMP, FXEM China or Korea). 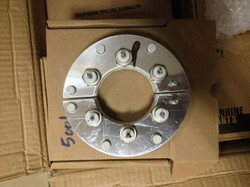 And we provide All kinds of genuine parts for Siemens marine generators (1FC4, 1FC5series&1FC6 series). 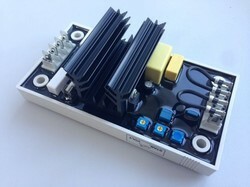 A thyristor voltage regulator was fitted so as to upgrade the ± 5% voltage tolerance previously achieved to ± 0.5%. The regulator in question is a pure voltage regulator, which uses the excitation current to keep the generator voltage constant irrespective of the load. The generator voltage is fed via the measuring circuit transformer to the regulator and rectified by a load-side rectifier bridge. The actual value signal and regulator input voltage are derived from this DC voltage. The voltage setpoint is input via an internal reference value potentiometer or external reference value setter. After an internal setpoint/ actual value comparison, the regulator amplifier outputs a DC voltage, which is converted by a loadside pulse generator into a firing pulse with adjustable time offset for the bypass thyristor. The bypass thyristor Vabs is situated in the excitation circuit between one phase and the anode-side output of the rectifier bridge in series with the bypass resistor Rabs (Fig. 4). The bypass circuit, parallel to excitation winding RE, is switched on in the time ranges at which valve V5 is conductive. 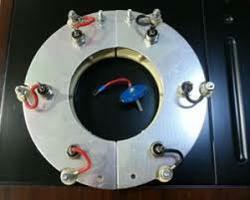 Part of the excitation current can therefore be made to bypass the excitation winding. This takes place within every period for a fraction of that period (control angle). 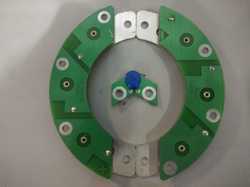 The excitation current is reduced in accordance with the control angle and the resistance ratio Rabs/ RE. RSK1101 used for the generator of BC16/18 series. RSK2001 used for the generator of UC22/27 series. 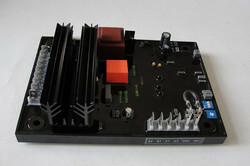 RSK5001 is designed for HC4/HC 5generator. Fits PC144, SC2 and SC3, UCI244 and UCI274 series Stamford Alternators. This AVR is suitable for brushless generators upto 1250kVA of all makes like Kirloskar, Leroysomer, Marathon, Trident, Stamford. 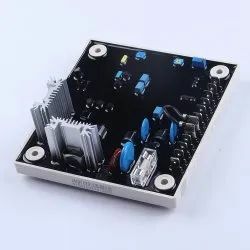 This AVR is a compact high performance encapsulated unit with latest technology and efficient Semiconductors to achieve a high degree of miniaturisation. 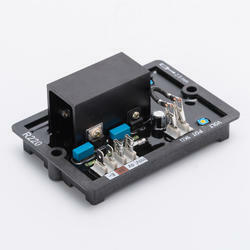 This AVR contains a solid state buildup circuitry to ensure positive voltage buildup from very low residual voltages. 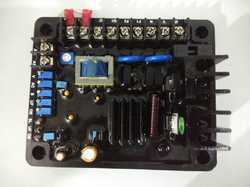 This AVR is having special features like over Excitation and Sense loss which protects alternator from high excitation and high voltage respectively with LED indications. In addition to this it includes under speed protection with LED indication to prevent the generator rotating parts from over heating due to over fluxing. This AVR is having Droop facility, External voltage adjustment pot for remote operation and The 'ACCESSORY INPUT' terminals, when interfaced with VAr/pf controller, Auto Synchronise & GCUs based on PLCs enable the generator parallel itself automatically with the bus and later on maintain either pf or VAr constant. 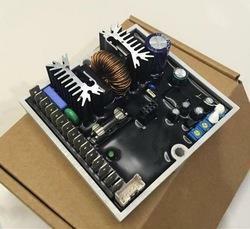 The Stamford MX341 Voltage Regulator AVR provides a steady, safe and controlled buildup of generator output voltage, making this voltage regulator a multifaceted yet stable model, which can be paired with similar products. This 100 percent original product, purchased directly from the original manufacturer, is backed by a certificate of authenticity and available for same-day shipping internationally. 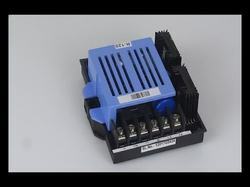 ORIGIN: Manufactured in the U.K.
EA16 16Amp is a Half Wave Universal Automatic Voltage Regulator that can also be used in a Genset parallel operation. Purchasing a new generator is a smart decision to ensure that you have a constant and stable supply of power in your home and business. 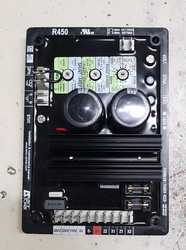 However, in order to ensure that your sensitive electronic equipment such as televisions, microwaves, and computers are safe, you need an original Marathon SE350 AVR. The Marathon Automatic Voltage Regulator will offer you a means of ensuring that your critical equipment operates within the voltage ranges as recommended by manufacturers. 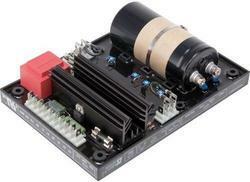 What is the Automatic Voltage Regulator? The Marathon SE350 voltage regulator is a critical generator component in ensuring that your generator output voltage is reliable and of quality. 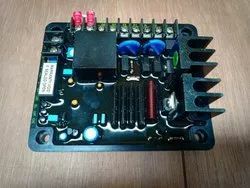 The AVR is a small, but economical, part that is the brainpower behind controlling and regulating the production of voltage by your generator at home or work. In the majority of applications, the loads always fluctuate and are sometimes unpredictable; your AVR is the component charged with the responsibility of ensuring that your Marathon alternator is responsive. This means that the alternator is better capable of quickly responding and adapting to load impacts during all operational stages. 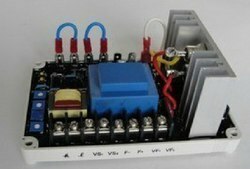 How does the Marathon SE350 voltage regulator AVR function? Inside the Marathon generator alternator is a small magnetic field created by the generator’s motion. The magnetic field creates residual voltage on the generator’s windings. The AVR then steps in and derives excitation from the residual voltage, creating more voltage on the generator’s exciter till the required voltage level is achieved. 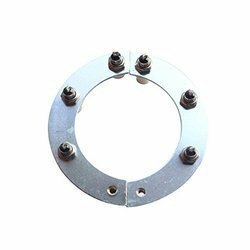 Choosing genuine parts for your generator is the wisest decision you can make. Your generator is only as strong as its weakest component and this can make an enormous difference between increased productivity and failure of your critical power systems. 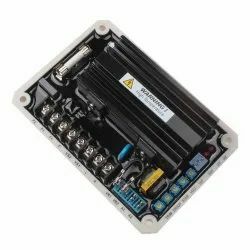 EA63-4 self excited brushless type automatic voltage regulator is a compatible replacement for Basler AVC63-4A regulator. Current Continuous 4A, Intermittent 7A for 60 sec. 9A for 10 sec. The voltage regulator type MARK I, is suitable for Synchronous Generators of MARELLI MOTORI make, MJB series, size range 160-500 frames. This regulator is proper to operate on machines rated from 10 up to 2000 kVA. The regulator is fully insulated in order to maintain high reliability also with severe ambient conditions (high level of humidity, dust, salt atmosphere), and in case of high vibrations level. The regulator is proper both for single and 3-phase operation. 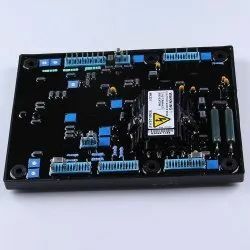 MECC ALTE UVR6 AVR manufactured by Meccalte is a highly popular voltage regulator used on the larger Mecc Alte frames to provide optimum voltage regulation and sensing. The regulator can be used in 1 phase or 3 phase applications and 50 or 60 hz frequencies, installation is very simple but should only be installed by an experienced and certified generator technician. 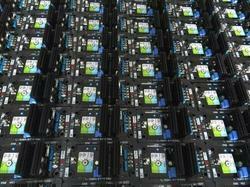 We offer free technical support to troubleshoot and installation. 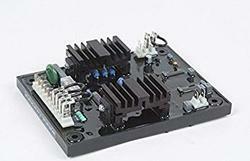 RSK Series diode sets are used on for Stamford alternators. 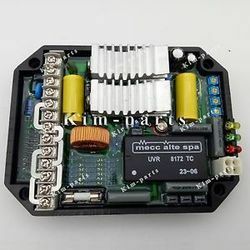 *RSK2001 DIODE KIT FOR UC22/27 SERIES ALTERNATORS. *RSK5001 DIODE KIT FOR HC4/HC5 SERIES ALTERNATORS. *RSK6001 DIODE KIT FOR HC7/LV6 SERIES ALTERNATORS. 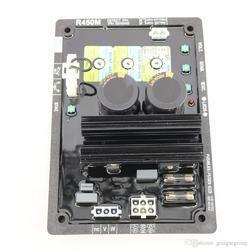 Following the built-in engine RPM drops, the frequency of output voltage drops to protect circuit.